Share with us: Make history! 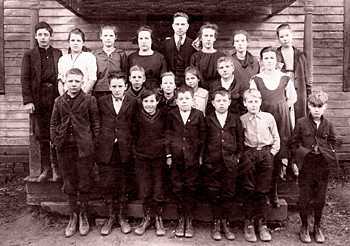 Hammondsville School, c 1917. Bill Sprague, teacher. Rear: 2nd from left, Doris Elliott. Front: 1st from left, Glenn Myers; 4th and 5th, Don and Dave Stewart. Remember a funny story, a special saying, a nickname, a recipe? Add to our archive of family memories! Start collecting your family history now! If this site has made you more interested in your family history, we're delighted! Now go out and collect the stories of your folks--it's not hard. Here's a "Family Folklife Interview" to get you started. Be sure to come back here and share what you discover! Search for photos and send a family photo postcard. Contribute a photo: Please email Janice Donley if you have photographs of people or heirlooms to contribute--we'll tell you how. Submit your contact information to allow other family members to find you. View family members' contact information. Email Sue Donley if you would like to keep in touch by being added to the family email discussion list. Other genealogists researching the family names on this site .